Go behind the scenes with King 5's Evening Magazine! Evening Magainzes, Michael King visit Life Proof Boats and learn about the details of what makes the boats so special. They also give an inside look at the building of the boats and the special team members that put them together. Northwest Yachting gave Life Proof Boats a nod as one of the highlights of the 2017 Seattle Boat Show. "These boats from Inventech Marine Solutions out of Bremerton, Washington are just too cool." “Usually when you buy something from a vendor, you get 89 percent of what they promised during the sale,” said Police Chief Hoyle during a demonstration cruise on Lake Norman in early November. “We got 120 percent. That just doesn’t happen." 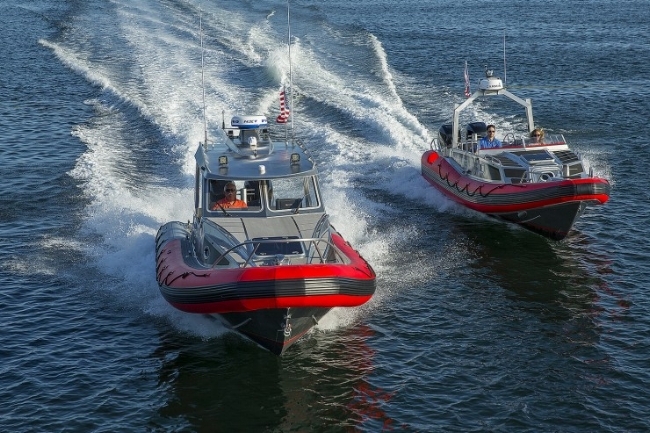 Among the boat’s features is a first-of-its-kind drop-down ladder on the bow for beach landings and water extractions, twin 250-horsepower engines for speed and maneuverability, a secondary helm behind the cabin that provides the driver better visibility for maneuvering in crowded situations, shock-absorbing seats that also offer officers the option of standing or sitting, and a walk-through, 10-foot-wide cabin that features a heating system that operates on an independent, diesel-powered engine. Kirk Moore, of WorkBoat magazine, take a look at LifeProof Boat's 30ft convertible at the Pacific Marine Expo. Mike Carey from NWFR came out to our shop to do a shop tour and see what makes our boats different than our competition. They put together a great video showing our boats. Take a look, the video is featured here to the right. Captain Bob McLaughlin sat down with the founders of Life Proof Boats to tell the story of the company and what might to expect from them in the future. Click Here to be taken to the audio Podcast.